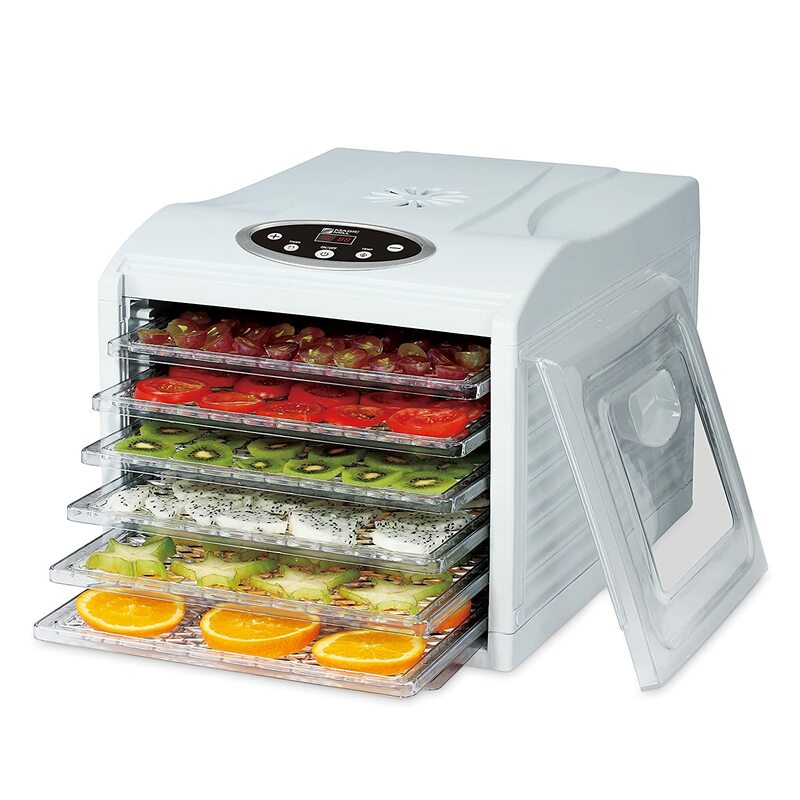 The Magic Mill dehydrator is spacious, highly functional and works efficiently to preserve a wide variety of foods. More than six square feet of drying space allows for preservation of all types of healthy foods in large batches to save time while automated features make preserving foods virtually effortless. The Magic Mill countertop food dehydrator incorporates a variety of features that make the appliance a good choice for gardeners, health enthusiasts, sportsmen, and families who want to preserve seasonal foods for year round use or to prepare healthier snacks without the additives found in commercial foods. The Magic Mill has six mesh drying trays that are 12” x 13” which equates to drying of up to six pounds of food at one time. This feature is an important one for anyone who is preserving produce from the garden, jerky to last for an entire sports season, or even dog treats for their pets. The large capacity means the dehydrator can handle large batches that save time and energy over doing multiple batches. 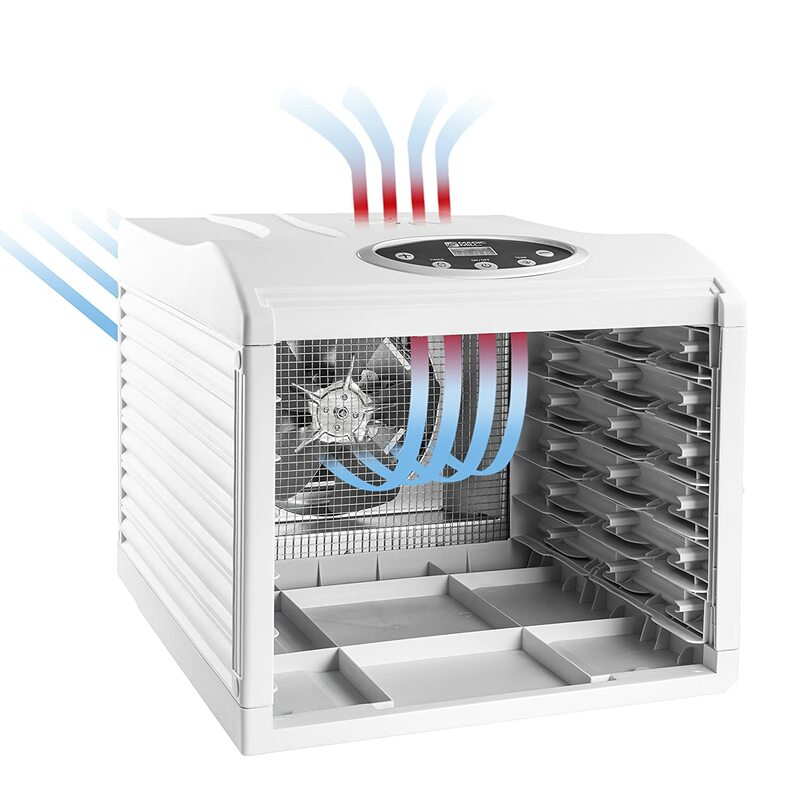 The combination of a rear-mounted fan and back-to-front horizontal airflow technology results in even drying of food in every area on each try. This design also prevents overheating of food so that each type of food is dried efficiently without losing nutrients or flavor. Like many other users, the thermostat and timer are two of the most important features to me. The option to set the dehydrator at any temperature from 95°F to 158°F is what gives the dehydrator its versatility. Different types of foods have different optimum temperatures to thoroughly dehydrate and perfectly preserve the nutrition and flavor of each. For example, making yogurt requires you to run the unit at a low temperature for eight hours while herbs can be dried in as little as one to three hours. Beef jerky, on the other hand, takes between four and fifteen hours to dry to ensure all moisture is removed and there is no risk of bacteria growth. Like the temperature control, the timer makes it easy to set the dehydrator for the optimal dehydrating time for the food I am drying and the automatic shutoff prevents foods from being over dried. I can go about my business and let the Magic Mill take care of dehydrating my food. The Magic Mill has eight preset cooking functions that let me select the optimum temperature for some of the most popular types of foods dried. All you have to do is touch a button and you remove the risk of setting the unit to the wrong temperature. The ability to look in on the progress of the drying process is especially beneficial when you are dehydrating a variety of foods. Instead of interrupting the process by opening the unit and checking individual trays, all that is needed is to peek through the front cover. Since the unit provides even dehydration across all trays, the progress you see in the front is the same that you can expect throughout the appliance. The Magic Mill dehydrator comes with an instruction manual, six stainless steel racks, six fine mesh trays, and two silicone oven mitts. This unit is spacious enough to handle large batches while the unit is compact enough to fit easily onto most kitchen countertops. The white color makes the unit a good choice for any kitchen décor and the finish is easy to clean. The only real complaint against the Magic Mill is that it is not expandable. However, the six generous drying trays provide adequate drying space for most home users. Most consumers find the dehydrator user friendly with an easy-to-read and intuitive digital display that lets you read the temperature and timer settings so you can count down the progress or just wait for the timer to sound. The majority of buyers find the dehydrator to be quieter than most other home models while producing results they might expect from commercial quality machines. You can read user reviews here. At most places where the Magic Mill dehydrator is offered, the unit is priced in the middle of the pack. You will usually find the best deals at Amazon. Check here for the lowest price.